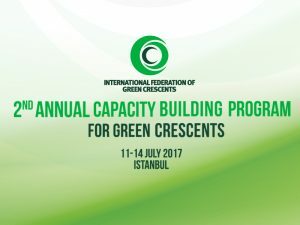 International Federation of Green Crescents is organizing the “2nd Annual Capacity Building Program for Green Crescents” between 11-14 July 2017 in Istanbul. During the event attended by 80 representatives from 31 countries including Albania, Bulgaria, Indonesia, Kenya, Cyprus(nr), Lebanon, Malaysia, Senegal, China and Tanzania, capacity building trainings will be held and addiction policies pursued by national Green Crescents will be discussed. At the panel where the opening speech will be delivered by Prof. M. İhsan Karaman, President of the International Federation of Green Crescents, sessions on “Prevention, Advocacy, and Rehabilitation Models”, “Tobacco Products, Health Consequences of Tobacco Use, and Tobacco Control”, “Policy Making on Addictions” and PCM and International Green Crescent Financial Support Program will be held.